Choose Command→System Preferences and click the General icon. Or, Control-click the System Preferences icon on the Dock and choose General from the menu that opens. From the Appearance and Highlight Color pop-up menus, choose your color variations. The Appearance pop-up menu defines the colors that normally show up on windows, buttons, and so on. The Highlight Color pop-up menu defines the color of items that you select. From the Sidebar Icon Size pop-up menu, choose the size of icons in the Sidebar of the Finder window. Select the radio buttons and check boxes to adjust how the scroll bars work. Automatically Based on Mouse or Trackpad reveals scroll bars only when the window is smaller than its contents. This gives you a visual clue that there’s more than meets the eye. When Scrolling uses a shadowy black oblong that appears only when you are hovering over the right edge of the window if you’re scrolling up and down, or on the bottom of the window if you’re scrolling left to right. The advantage is that scroll bars don’t take up precious window real estate. Always puts right side and bottom scroll bars on your windows whether you need them or not. Jump to the Next Page moves your document up or down one page when you click above or below the scroller in the scroll bar. Jump to the Spot That’s Clicked takes you to the position in your document more or less in relation to where you clicked the scroll bar. If you click near the bottom of the scroll bar, the window jumps toward the end of the document. (Recommended) Select the Close Windows When Quitting an Application check box to only open the app (and no windows) when you restart an app. By default, when you quit an app, windows that are open in that app close. Then, when you restart the app, the windows that were open when you quit automatically reopen. From the Recent Items pop-up menu, choose how many items you want to appear in the Recent Items list under the Command menu. Select the LCD Font Smoothing When Available check box to make fonts appear smoother. Click the Close button to close the General preferences pane. 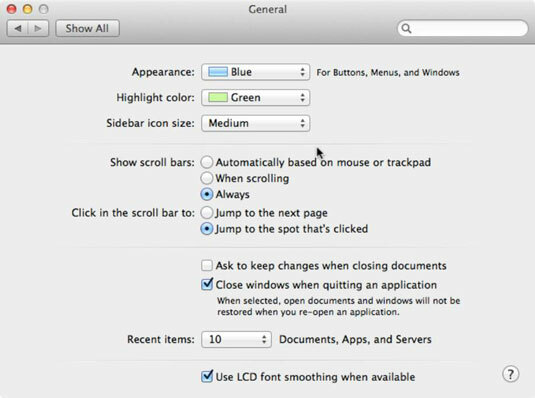 To move quickly between one System Preferences pane and another, click and hold the Show All button to reveal a pop-up menu that lists all the preferences items in alphabetical order.